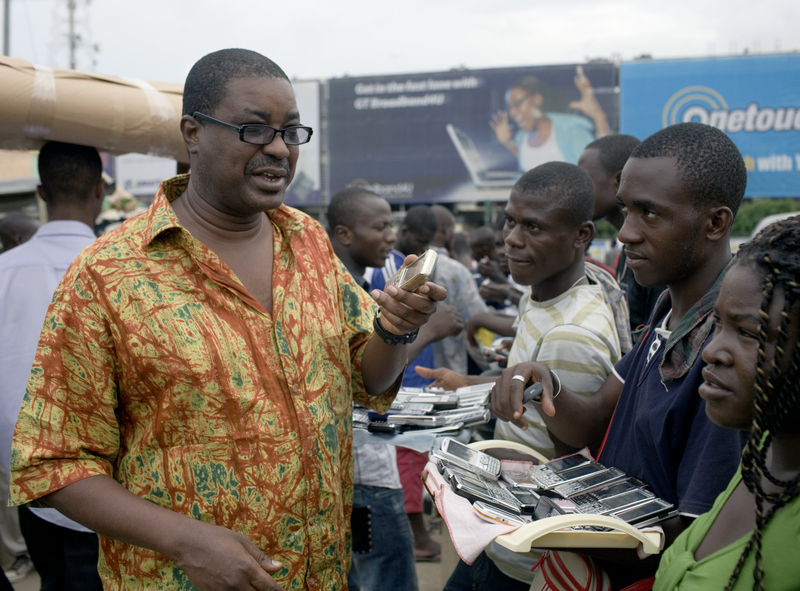 Herman Chinery-Hesse, founder and CEO of Soft Tribe, one of West Africa’s biggest e-commerce companies, talks with mobile phone dealers in Accra, Ghana, June 14, 2008. China’s infrastructure-building spree in Africa is now visible in dozens of countries across the continent. Big signs that advertise the names of Chinese state-owned contractors hang over construction sites for roads, railways, airports, and other projects. But out of sight, the Chinese are also leading another infrastructure building boom that is just as important, if not more, than the thousands of kilometers of roads they’re building. Chinese tech companies are now the most important players in Africa’s rapid emergence as one of the world’s fastest growing digital markets. People’s Republic of China companies, private and state-owned, are working with local telecom operators across Africa to build powerful new data hubs to accommodate the surge in Internet traffic, wiring up the continent with new fiber optic connections, and selling enormous quantities of low-cost smartphones that make it possible for millions of consumers to go online for the first time. Iginio Gagliardone, a new media and human rights researcher at both Wits University in Johannesburg and Oxford University in the United Kingdom, joins Eric and Cobus to discuss China’s increasingly vital, albeit controversial, role in the development of Africa’s information technology market.